Speaking hours before Hamas began its Tuesday murder spree, Chief of General Staff Lt.-Gen. Moshe Ya'alon said he ordered the air force to use insufficient force to carry out its mission of bombing the Hamas leadership during its meeting in Gaza on Saturday. Ya'alon explained that he had purposely caused the mission of decapitating the Hamas leadership to fail, because he wished to avoid killing "innocent civilians." Not surprisingly, the anemic strike did not deter Hamas. Ahmed Yassin immediately called for revenge. And so it was that the innocent civilians who were killed were not Palestinians who were acting as human shields for mass murderers. They were Jews waiting for buses and drinking coffee. Apparently not learning the lesson, in its strike against Hamas leader Mahmoud al-Zahar on Wednesday the IDF again employed insufficient force to destroy the target. The IDF announced that the mission had again been purposely handicapped in order to avert collateral damage. Picking up on the message of disorientation and weakness from the army, Zahar issued a vitriolic threat to begin bombing Israeli homes. On Thursday we learned that both of Tuesday's human bombs had been held in administrative detention in Ketziot Military Prison until their release six months ago. Was this part of the confidence-building measures that Israel provided for the PA and the Bush administration to show that Israel wants peace? Neither of these murderers had personally been involved in murders when they were released. Did anyone talk to these true believers while they were in custody? Did anyone follow them once they were released? Clearly the answer is no. And clearly, they were unimpressed by Israel's humanitarian gesture. In his first public remarks after the Tzrifin and Jerusalem bombings, Prime Minister Ariel Sharon told his Indian hosts that Israel wants to make peace and is willing to make painful concessions for peace. What message did this statement send the Palestinians? Can Sharon honestly believe that it gave them pause as they danced and hooted in exultation for having sent Nava Applebaum's wedding guests to the cemetery to bury her and her father instead of to her wedding canopy to celebrate with them? What are we to make of the murderous responses to Israeli statements of goodwill? How are these responses to inform our future actions? In remarks Wednesday ahead of the anniversary of the September 11 attacks, US Defense Secretary Donald Rumsfeld said that the terror regimes that the US has brought down in Afghanistan and Iraq were not moved by US deterrence. The Taliban, Rumsfeld said, allowed al-Qaida to use its territory as its base of operations for attacks on the US without a thought for its own survival. Saddam Hussein ignored 17 UN Security Council resolutions assuming that the US would never lift a finger against him. Rumsfeld said that he could not give an explanation for why these regimes did not fear their eventual destruction. On Monday, Brig.-Gen. Yossi Kupperwasser, the head of Military Intelligence's Research Division, provided the answer. Speaking at the Herzliya Interdisciplinary Center's conference, "Post Modern Terrorism Trends, Scenarios, and Future Threats," Kupperwasser said that terrorist regimes are the exact opposite of democracies. While democratic societies turn their efforts towards expanding freedom and economic prosperity in the interests of enabling "the pursuit of happiness," terrorist regimes "cultivate the pursuit of suffering." According to Kupperwasser, subjects in terrorist regimes like the Palestinian Authority must believe that the purpose of their lives is to die to destroy their enemy. In this environment, economic depression is acceptable. As he noted, "Hamas carries out attacks that are aimed at making the Palestinians poorer." Hence they have targeted the Erez Industrial Zone and the Karni cargo terminal in Gaza. The sole purpose these areas were created to serve is the provision of employment for Palestinians in Gaza. Every sacrifice in the advance of the destruction of the enemy is divinely dictated whether by Big Brother Arafat or by Allah himself. On a positive note, Kupperwasser argued that the EU's decision over the weekend to classify Hamas's so-called political wing as a terrorist organization constitutes "a strategic victory" for Israel. Yet, while the EU's belated decision is no doubt welcome, to call it a strategic victory is to overreach. It is nice that after three years of the unrelenting terrorist war on Israel, the EU was willing to pass a non-binding resolution of this sort against Hamas. But in truth it is Israel, not the EU, that will be the source of a true strategic advance in this war. Such an advance that will pave the way for eventual victory will not be the result of simply killing Hamas leaders, although such killing is essential. 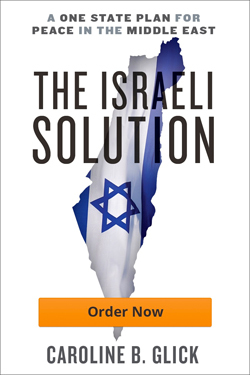 A true strategic advance in the war that will pave the way for Israel's eventual victory will come with strategic clarity. When the Israeli government acts on the knowledge that not only is there no distinction between the various wings of Hamas, but there is no distinction between the PA and its Fatah, Tanzim, and Aksa Brigades terror cells and when the government bases its actions on the fact that there is no distinction between the PA and Hamas, Israel will find itself on the road to true victory. Why is this? A few weeks ago, Dr. Joel Fishman, a researcher at the Jerusalem Center for Public Affairs, published a compelling essay about Israel's fundamental misstep in contending with the Palestinian war. Fishman explains through historical analysis that the PLO, like its partner Hamas, fights its war for the destruction of Israel not only by launching a military-terrorist campaign against the state, but also, and perhaps more importantly, by fighting a political war against the country. The PLO adopted its dual strategy against Israel after consulting with North Vietnamese commanders in Hanoi in the late 1960s. There it was explained to Yasser Arafat and his aide Salah Khalaf that the way to fight and win an asymmetrical war against a democratic and militarily powerful enemy is by causing, through propaganda and other means of psychological warfare, the internal disintegration of the democratic enemy's will to fight. By cultivating constituencies within the enemy state as well as in the international community they would be able to render the democracy incapable of defending itself against aggression. The terrorist component of the war is used to achieve the same goal of societal disintegration. In speaking of suicide operations, Kupperwasser noted that suicide attacks cause a psychological weakening of the enemy society. "Not only [do such attacks] force the enemy to pay a terrible economic and physical price, they tell him that if you believe so much in your cause that you are willing to die there must be something to what you are saying. The enemy is motivated to check the legitimacy of his position against you," Kupperwasser said. Of course, to mobilize people to strap explosives belts to their body and blow themselves up in a cafe or on a bus, these mass murderers must themselves undergo indoctrination and terrorization. The PA's systematic killing of Palestinians it labels as collaborators with Israel provides a Soviet-style sense of justice in the PA ruled areas. These executions as well as the conduct of arbitrary arrest, imprisonment, torture, and land confiscation by PA forces have brought Palestinian society to a point of psychological weakness and disorientation. the IDF arrests 250 terrorists in Judea and Samaria, because of the PA indoctrination and terror these men can be replaced immediately with other willing executioners. And so we see that like the Taliban in Afghanistan and the Ba'athists in Iraq, the PA is a totalitarian entity through and through, little different from the Soviet Union. In assessing how to win this war, Israel in fact should take a lesson from the man most responsible for destroying the Soviet Union and ending the Cold War – President Ronald Reagan. This is so, because at its most basic level, in fighting the US, the Soviet Union mirrored the PLO's campaign against Israel. In both instances, the totalitarian entity believed that coexistence with its enemy was an ideological impossibility. At the end of the day, only one side would survive. During the 1970s, the US tried through detente to peacefully coexist with the Soviet Union. The Soviets did not appreciate the US gestures but rather pocketed the concessions and invaded Afghanistan. Recognizing the true nature of the USSR, Reagan came forward and adopted the Soviet view of the rivalry and set out to ensure that the US, not the USSR, would be the side left standing. During his presidency, Reagan consciously engaged the Soviets at every level. In championing human rights and labeling the Soviet Union "the evil empire," Reagan launched an ideological and political battle against the Kremlin. In fighting the Soviets in Nicaragua, Grenada, and Afghanistan, Reagan forced the Soviets onto the military defensive and emerged victorious. In launching Star Wars Reagan brought the technological advantages of a free society to bear against the intellectually barren Soviets. Within a decade, the most feared regime in the world was no more. When Reagan launched his own "people's war" against the Soviet Union, he did so above the shrill criticism and hysterical protests of the mainstream US media, the Democratic party, and the governments of Western Europe. These opponents challenged him every step of the way. They portrayed him as a murderer, a criminal, a lunatic, and a simpleton. But he was right and the American people knew it. While the Palestinians have the advantage of ideological uniformity and mass indoctrination, Israel has the power of freedom and democracy. We can learn from our mistakes and innovate. We can grow our economy, expand our markets, and combat our enemies on the fields of our choosing. If we have the courage of our convictions in our basic decency and morality, we can identify our enemy for who he really is and what he is trying to achieve. All it takes is will and fortitude and honesty. The Palestinians fight their people's war against the Israeli people. It is the Israeli people that, if just given the signal from our leadership, will win this war for our survival.